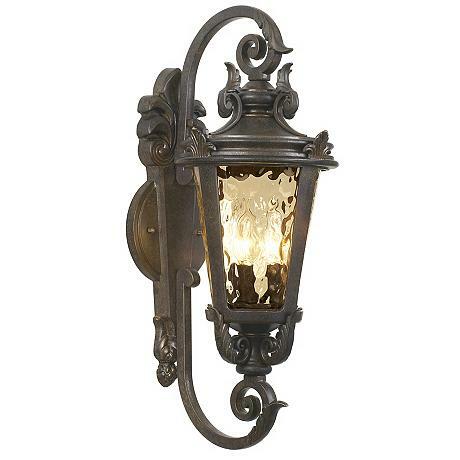 Inspired by the romantic Mediterranean, this handsome outdoor wall light adds curb appeal to porches and entryways. The allure and romance of the south of France beckons with this handsome outdoor wall light. It comes in a handsome veranda bronze finish. With champagne hammered glass that offers an antique look. A wonderful design for entry spaces, garage areas and more. • From the John Timberland lighting collection. • Uses three 40 watt candelabra bulbs (not included). • 21 1/2" high and 9" wide. • Extends 10 1/2" from the wall. • Backplate is 16" high, 5 1/2" wide. • Mounting point to top of fixture is 10 1/2".